On this April 14, I decided to write a few lines about my thoughts on Abraham Lincoln. This is not a book review or anything I have researched or drafted - just a few random thoughts that I decided to share on this 154th anniversary of such a sad, tragic day. I've always admired Lincoln's work ethic and focus. Even when he lost an election in Illinois, struggled to make a living in New Salem or faced difficulties dealing with women, he just "kept on keeping on." He did have a bout of depression and certainly had tough times, but none of them stopped him until the horrendous act at Ford's Theater on that awful Good Friday. He kept moving forward in life, from poor boy, to store clerk, to surveyor, attorney, state legislator, Congressman and President. Of course, it is impossible to write about Lincoln without noting his writing skills. His speeches and papers are so incredible. I especially like his Second Inaugural, even though every time I start to claim that as my favorite of his works, I keep coming back to the brevity of and phrasing in the Gettysburg Address. I simply cannot make a decision on which I prefer, though I think the Second Inaugural deserves more attention than it gets. "With malice towards none, with charity for all" is just a brilliant phrase, even if not as well-known as "Four score and seven years ago." Part of this post, I admit, is because I have not written much lately, but on Facebook this morning I someone mention that he/she makes a Lincoln post on this date every year. I don't know that I will do that, but it is a good idea that I wish I had thought of and I am going to "borrow" that idea at least for today. Lincoln was born in Kentucky and when I was in elementary school, I learned that fact. Since I also was born in the Bluegrass State, that fact caught my attention. I guess I have always enjoyed stuff with a local connection or else a love of Kentucky was always a part of me. I have admired him since my school days and when I read about Lincoln, the Civil War was a natural off-shoot of that reading and my love of the war developed from there. A few years ago, I took a trip to Lincoln's birthplace and boyhood home in Hodgenville. The birthplace building was closed for renovation so I did not go through it and have not made a return trip. That would be a good idea for this summer, but I said the same thing last year. It is easy to say things or make plans than to do them. Last year, I did read a biography on John Wilkes Booth. I had previously thought I would never do such a thing, as it felt weird to study the creator of such a horrible act, but I am glad I read it. It humanized Booth, yet still showed the awful, perhaps cowardly, side of him that led to the tragedy at the theater. His life was more than that one act and though April 14, 1865 properly does define his legacy, there was a lifetime that led up to it and he did have family and friends, just like other people. He was not born a monster who spent his entire life doing such deeds. I still have not read any of the books specifically about the assassination and the hunt for Booth and maybe I should. Like the travelling, though, that is easier said than done. I know this is far from my best or most in-depth post, but it does feel good to type these words and express my thoughts on this date and I am glad I saw the Facebook post that gave me the idea. 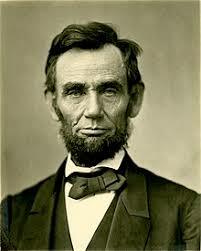 Abraham Lincoln is, has been and will continue to be the historical figure I admire the most. There is no doubt about it. His strength, ambition, persistence, intelligence and many other traits made him a fascinating character and the situation in which he found himself as President gave him the opportunity to prove his greatness. He was the right man at the right place at the right time.